Download cards without the wait. 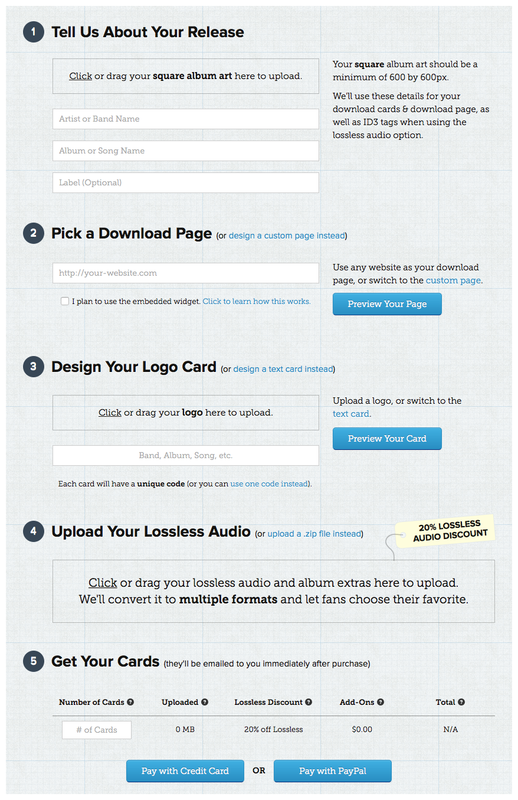 "Card Included is a brand new service that makes music download cards cheap and easy." Use any site as your download page's background or create a custom page. You can even use our embedded widget, if you're familiar with HTML. For added security, you can prevent downloads until a certain date. Decide if you want your codes to last one, two, or even three years. To help plan your next tour, we can make fan locations available for download. Upload a logo or just use text for your download card details. If you upload lossless audio, we'll let your fans choose their favorite format. Don't have lossless? Just upload a zip file. After paying, we instantly send you a pdf of your cards. We'll also include a text file if you want to email a code to someone. Not convinced? Why not design and preview a card with our free designer.